From the maker of the WobL -- now comes the WobL +. 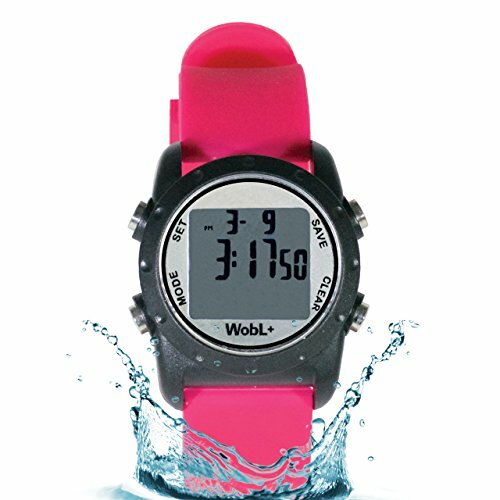 The Wobl + Watch is the smallest vibrating waterproof alarm reminder watch in the world! The WobL + bands are made of silicone for more comfort and will fit wrist sizes: 4.50 inch to 8 inch. The WobL + also allows for easier access to the batteries to make changing those when needed a breeze. You can also interchange the bands! The WobL + features include 9 independent alarms, extended intervals for the countdown timer (1 minute to 24 hours), easier setup, ability to erase/shut off the countdown timer, and is now waterproof! The WobL + does have a discreet sound alarm feature also BUT this is very quiet and should not be considered a loud alarm for others to hear. The Wobl + vibration alarms are great for daily discreet reminders. These watches are the perfect choice for reminders for timed medications, bathroom breaks, important tasks, and more. The watch is also great to assist those with visual or hearing impairment, ADHD and ADD, and diabetes. WobL + is a popular choice for helping children, women, and those with small wrists to stay on task! If you have any questions about this product by WobL Watch, contact us by completing and submitting the form below. If you are looking for a specif part number, please include it with your message.